Visit Olduvai Gorge, a 90 metres deep and 50 km long ravine at the North West of the Ngorongoro crater that holds the oldest evidence of mankind's evolution. The canyon has been built from several layers volcanic rock that in approximately two millions year time has been formed. A perfect spot for scientists who study the evolution, extremely suitable thanks to the rivers which have worn out this ravine in about two million years time, by studying this volcanic rock layer by layer. In 1959, Mary Leaky found a 1.8 million year old monkey like skull confessed as Australopithecus boisei, this skull was very important for those that back up the evolution theory. In 1972, in Laetoli (45 kilometers south of Olduvai Gorge) human like foot steps were found which are estimate to be 3.7 millions year old. Among others findings in this canyon, and finds done in Kenya and Ethiopia, scientists know that there must have lived at least three different types of human beings. The official Olduvai Gorge theory is like this: Australopithecus boisei, Homo habilis and Homo erectus must be evaluated in Homo sapiens, the modern people. This theory is proved by more recent finds in higher lain layers of volcanic rock in the Olduvai Gorge. A small but interesting museum has been arranged about this subject on the way to the Serengeti. 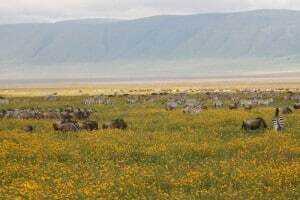 You can combine the visit with the Ngorongoro crater with a visit to the Olduvai Gorge, the cradle of humanity.There is the possibility to visit the ravine and enter the canyon, and to bring a visit to the site of Australopithecus boisei.